I found a good balance between simplicity of use and technological integration in my previous Sony Ericsson phones K750i and K550 and they were part of my organized life. All it needed was a good PC companion freeware, myPhoneExplorer in my case, to synchronize with Google Calendar and backup the phonebook. All these became suddenly more complicated with the arrival of the HCT TyTNII. The blame is not on the device itself, which is all a geek can dream of, but to the Operating System (Windows Mobile 6.1). - Softick Card Export II: to use the TyTNII memory card as a smart drive on PC, as I used to do naturally with my SE phones. - BirdieSync: to force ActiveSync to synchronize with Thunderbird instead of MS-Outlook. These two applications, despite they are no freeware, are the main reason why I kept my TyTNII for almost a year. With the arrival of the G705, I could resume on using myPhoneExplorer (which I really missed) and retrieve the legendary simplicity of use of Sony Ericsson phones. 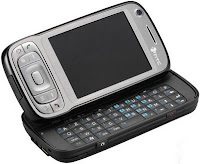 The only regrettable evolution is that now the use of MTP protocol when plugged in Phone Mode device on the computer. The Mass Storage mode used before was more flexible for synchronizing non-multimedia files. Hopefully the USB Ethernet Emulation driver allows to reach the phone's content as a network drive through \\g705... but it's slower. In both TyTNII and G705 cases, I consider that such a small gadget cannot be your main in-car GPS device. For this there are cheap GPS with large screens and fast chipset (such as SirfStarIII) out there that do the trick much better.